In our recent Regcast, Build an open cloud: say no to silos, Dale Vile from Freeform Dynamics and Peter Mansell from HP discussed why and how to integrate your cloud platforms. To find out what you thought, we polled the audience. We should point out that a poll result on a Regcast is not a sound basis for policy decisions or budget allocations, but its results broadly agreed with recent research that Dale had conducted among the Reg audience. And we enjoy printing graphs, so here are the results. This poll was a little more taxing for the audience than most webinar questions, so why did Dale want to run it? The answer, he says, is that it shows how IT departments are coping with managing multiple cloud services, internal and external, and also helps to explain the process by which they improve those services over time. In the poll we offered three options, and because we know that things are never either/or in the real world, we asked how important each of these options would be. Here is a rough summary. 1. 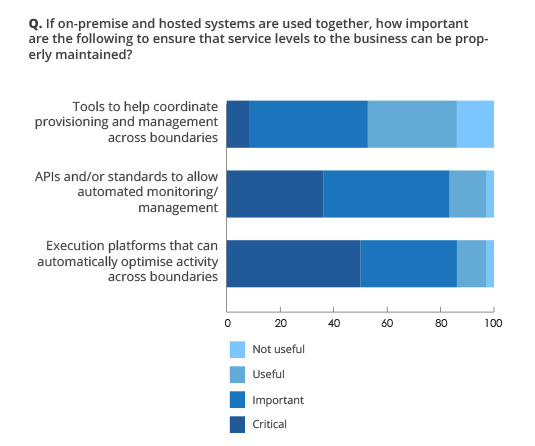 You think that tools to coordinate provisioning and management across boundaries are fundamental to protecting service levels in a hybrid environment. 2. Slightly, but only slightly, less important are APIs and standards so that monitoring can be automated. Both tools and standards are seen as important or critical by about seven out of eight of you. 3. Less important today: automated execution platforms. While almost everyone would find them useful, few of you find them critical. Yet. I asked Dale why he picked this question. “The first option focuses on allowing you to do the things that administrators have always done – but across boundaries,” he says. Cloud adoption is often reported as “rogue” business units driving innovation. In this interpretation the stick-in-the-mud admins refuse to let anyone prise their fingers off their precious servers. Yet when it comes to administration and management, Dale says, automating management from day one is impractical (our data suggests that most Reg readers’ employers agree). “You need to be comfortable with each step before you move on to the next one,” Dale says. According to HP, that is why the company is trying to create an environment where workloads can be placed, and moved, as appropriate. “HP CloudSystem focuses on enabling the hybrid environment so we can place the right workload in the right place at the right time,” says Mansell. Using tools and automated reporting, in this case, becomes a learning experience to discover both what is possible and what is wise. As you integrate your cloud services under a management umbrella, those tools will make recommendations. The advantage of building an open cloud is that your management tools have a more complete view without silos, and so can start to make bigger recommendations. Data will move outside the organisation. Different workloads will have different service levels, or be decommissioned. Self-service will become more common. Eventually, Dale speculates, your task in some areas might just be to click “Yes” to almost all the suggested changes that you monitor. “At which point you might as well let the system get on with it,” he says. The trick is to learn what you are saying “yes” to. That point is reached by a process of learning and reporting, not through a technological race to automate or by outsourcing the process. Cloud service levels bundle performance with risk management, customer service with security, efficiency with your legal and regulatory responsibilities. You can’t automate risk management away. We have discussed on Regcasts before that increased automation is the only long-term solution to optimise the placement of workloads. But it is a journey, not just a destination.